The most important event for Associate cricket gets underway in South Africa tomorrow as the 12 top teams below Test level fight it out in the ICC Cricket World Cup Qualifier. With four places on offer at the ICC Cricket World Cup 2011, the competition is going to be fierce in what is a hugely significant tournament for cricket. “For our top Associate and Affiliate Members this is probably the most important 19 days in any four-year cycle and it will determine whether they qualify for the ICC Cricket World Cup and where they stand in the global scheme of things,” said ICC President David Morgan. “This is the culmination of a long pathway giving each of our 94 Associate and Affiliate Members the chance to take on the very best in the world at the highest level. While finishing in the top four is the main aim, the top six teams will win ODI status for the next four years at least as well as book a place in the ICC World Twenty20 Qualifier and also will gain automatic qualification for the ICC Intercontinental Cup 2009-10, which starts in May. “This is all part of the ICC’s commitment to grow the game and narrow the gap between the top Associate teams and the very best sides in the world,” said Mr Morgan. In total there are eight venues being used for 54 matches played over 19 days with 12 teams fighting it out for the four qualification places on offer in the ICC Cricket World Cup 2011. The ICC Cricket World Cup Qualifier, formerly known as the ICC Trophy, incorporates Divisions 1 and 2 of the Pepsi ICC World Cricket League and is the gateway for the top Associate and Affiliate teams into the premier one-day tournament in the world. Day one of the event offers up perhaps the most eagerly awaited fixture of all with defending champion Scotland taking on fierce rival Ireland in an ODI at Willowmoore Park in what will be a repeat of the 2005 final. One player likely to be taking the field in that match tomorrow will be Trent Johnston, who led Ireland to victory over Test nations Pakistan and Bangladesh at the ICC Cricket World Cup 2007 in the West Indies. Although no longer captain of the team, Johnston’s hunger for success has not waned. “The experience of playing at the World Cup and getting through to the Super Eight in the Caribbean two years ago is something that will stay with us forever,” said the all-rounder. Johnston’s sentiments were echoed by Canada’s John Davison, who has played in two World Cups. “Every international cricketer wants to play against the best and the top four sides in this tournament will get that chance. It’s a huge incentive for us. Those of us who have been lucky to play in the World Cup know what it’s like and the other guys in the squad want that feeling too. The result is that this tournament is going to be intense and very closely fought. No one will give you anything for free – you have to reach out and take it,” said Davison. Another veteran of the ICC Cricket World Cup is Kenya stalwart Steve Tikolo. The 37-year-old all-rounder has played in four World Cups (1996, 1999, 2003 and 2007) and he is very keen to make it a fifth before he hangs up his boots as a player. “This qualifier is one of those big tournaments you play cricket for. The stakes are high and the prize is a big one. To represent your country at a World Cup is the stuff of dreams for most people so we never allow ourselves to take our place for granted. It’s not going to be easy to qualify this time around but we will be doing everything in our power to make sure Kenya is represented in 2011. “The feeling of running out in front of a big crowd at the World Cup is something you can never grow tired of and all the players from all the teams will doing their utmost to share in that experience,” said Tikolo. Mr Morgan added: “When I look back on the history of this tournament, which started in 1979, I recall some great moments. It has been a stepping stone for some teams towards full membership of the ICC such as Zimbabwe, Sri Lanka and Bangladesh while for others it is an end in itself and certainly the 2005 final between Ireland and Scotland in front of a big crowd in Dublin was a memorable occasion in its own right with the Scots eventually winning a high-scoring game. Among the teams will be Afghanistan and Uganda, which both qualified from January’s Pepsi World Cricket League Division 3 event in Buenos Aires. The WCL was created to provide a clear pathway for teams outside the top 10 towards improvement and ultimately, the ICC Cricket World Cup. This global event gives ICC Associate and Affiliate Members the opportunity to play similarly ranked sides in meaningful competition regardless of where they are located in the world. The official web site for the WC qualifiers has a series of audio interviews, including one with Canada coach Pubudu Dassanayake, who says his team has been preparing well and is looking forward to the opening fixture against Oman. Ashish Bagai also speaks about his side- a good mixture of wise old heads and exciting young talent. April 1st- April Fool’s Day – marks the start of the World Cup Qualifier in South Africa. The Canadian squad embarks on what may be an epic journey to the World Cup, scheduled to be held in the four Asian Test cricket playing countries India, Pakistan, Sri Lanka and Bangladesh during the months of February and March 2011. Placing in the top four of this 12 team tournament books them a place in the finals, and serious financial support over the next two years. A top four placement will be difficult- Associates powerhouses Kenya, Scotland and Ireland are picked to advance, and Canada will be in tough against Namibia, Netherlands, and Denmark. The 15 players representing Canada have sacrificed much to be part of this team, and if they do qualify will sacrifice even more to follow their dream of playing at the highest level of the game. Many of them have been to the World Cup before – in South Africa in 2003 and the West Indies in 2007. In some cases their performances might be best forgotten, but the opportunity is there to test your abilities against the best in the world, and in some cases to flourish. Few Canadian cricket fans will forget John Davison’s stunning century against the West Indies in 2003. Most of the team are part-timers- amateurs- who rely on the generosity of employers for their participation. Some, like skipper Ashish Bagai have put their careers on hold in order to participate. Several of these players have professional careers in cricket outside of Canada, but are willing to take time away from work and family to represent Canada. John Davison, who played professional cricket in Australia for many years, and these days coaches at Australia's Centre of Excellence has a young family at home. At home in Canada, the national cricket administration is under fire. Cricket Canada CEO Atul Ahuja was dismissed late last year, and vice-president Mike Kendall resigned, later waging a PR war in the press over his differences of opinion with Ben Sennick, Cricket Canada’s president. There were rumours of a no confidence vote at last weeks Annual General Meeting, and Toronto residents were likely bemused at the sight of an anti Cricket Canada demonstration on the city’s streets. There’s no doubt that the war of words and political maneuvering at home is being noticed the team in South Africa, and may give the team the impression that they do not have the support of the Canadian cricket community. Canadian cricket has been dogged by infighting for years- there is regional and ethnic fractionation and this has not done Canadian cricket any good on the global stage. The Canadian players now in South Africa, however, are not responsible for any of this, yet are carrying a huge responsibility for the future of Canadian cricket. Qualification for the World Cup will bring funding, coaching support and media coverage in Canada- a basis from which grass-roots cricket can grow. However, surely, for the next two weeks, all Canadian cricket supporters should put aside their differences and come together to support those fifteen players in South Africa. We may differ on the selector’s choices, the choice of coach, who should administer Canadian cricket or much else; but we can agree on this - Go Canada! My name is Dan Kiesel. I am a physician, a medical osteopath and a physiotherapist. Currently I am with the Canadian Senior Men’s Team. I am writing to you all today, with grave concerns about the current direction of the board. This current status in Canada has made it necessary to address you as I feel bound by my duty to speak on this point. I share the vision and direction of Cricket Canada and am fully in support of the coaches, management staff, and players as we are ready to feel the benefits of the hard work. The ship is on course at this moment of our history. When Mr. Sennik inherited the Cricket Canada Association, it was a board in crisis, not only financially but also with the future of the sport in Canada at stake. It is a remarkable statement of fact with his team of hard working executive members and vision, he forged a new beginning for cricket in our country. This multi-dimensional vision included a new approach to administration, financial reporting, coaching, and the treatment of players. This is all in line with the ICC’s global vision for associate countries to elevate their thinking and structure on the path towards full member status. Positive feedback from the ICC at tournaments substantiates his leadership in this respect. The ICC will not tolerate poor and inexperienced leadership. The current political instability within the organization must be wary of the recent self inflicted trouble experienced by cricket in the United States America. We must avoid this in Canada by any and all means. Mr Sennik’s relationship with the ICC is a matter of record and distinction, and an example of how associate countries should maintain this balance. In order to achieve his progressive vision, he has in this past year, assembled a forward thinking and progressive executive team led by the young and distinctive Ravin Moorthy. When we arrived in South Africa a few days ago to join the squad, and after participating in various training sessions, I found the team in a high level of mental and physical level. Much higher than I have ever seen before. The decision to send players and a qualifier management team to Sri Lanka was the best I could imagine. This includes the coach, Mr Pubudu Dassanayke, and staff that accompanied him, Rathan Moorthy with his documentation and analysis, made clear decisions for the players how to improve their performance. I would like to mention here, Mr Chandrishan Perera, who did a marvelous job with the team related to their mental and physical fitness. I personally have known Mr Perera, since 1992/3 when I was in Sri Lanka and when I heard that he was going to work with the team, I knew that we were in his most capable hands. The result of his work is enormous and what he has achieved in a relatively short period of time is magic. The fact that the players could have left for weeks to Sri Lanka could only have materialized because of Mr Sennik and the executive’s bold decision to sign the players to financial contracts. Additionally, in the event that players had issues gaining time off, Mr Sennik engaged himself personally with their employers to make it happen. Now that the whole team is here at the tournament and training we will realize the maximum benefit. They have been told to focus on the task at hand and to leave any outside issues at home in Canada. They definitely do not need this potential political tsunami to distract them. Those who tried to create this Tsunami during this crucial crucial time do not appear to be interested in Canadian cricket but more so for their personal interest. The players feel very comfortable when Mr Ravin Moorthy joined the executive team with the responsibility of looking after the Senior Men’s Program. I have heard again and again Mr Ravin asking him to ask the players to come to him with any issue and he will help them … and surely he kept to his word. The same can be said for Mr Sennik. Everyone knows that he keeps his word and his promises. I ask myself a very clear question. What has he done so badly that he has to be removed prior to his term. We have witnessed previously corruption, illoyalty, false promises but that was definitely not in Mr Sennik’s habbits. He is not corrupt, he works hard, he doesn’t gain any material wealth. Rather he spends from his own pocket when it is required. We know his modesty and I’m sure none of the players really know how much time and money he has spent during his tenure as President. He was present in Ireland when we beat Namibia to qualify for the 2007 World Cup and one should’ve seen how proud and how happy he was with the team and that all his hard work had paid off. Mr. Sennik knew also at the appropriate time to speak hard words with the team, and to pinpoint weaknesses everyone knew that he was right. He did it for the sake of cricket and he wanted to see the improvement. In the past its known that ugly things have happened and I heard many times a big question, why were excellent people like Ron Aldridge and Howard Petrook removed from the team. Although they did excellent work known in Canada and ICC. We cannot afford to lose the leadership of both Mr Sennick and Mr Ravin Moorthy at this time or we will suffer a tremendous setback as when we lost Howard and Ron. I was present in a very ugly situation which happened 1996. It was the first tournament after the World Cup. And I wash to pass on the following details. In May 1995, I was with the Sri Lankan team in New Zealand and that was the first time that Sri Lanka had won a test match abroad. The next day we had a big party with the Sri Lankan fans in New Zealand, and Mr. Punjeeba (President of SL Cricket at the time) had a big vision. He said in the sense of Martin Luther King, “I HAVE A DREAM … in 10 years the Sri Lanka team will win the world cup. The players were angry. They we concerned that after winning match that they would go on and win the world cup. The New Zealand newspapers joked about it and felt humiliated at the fact that they were beat by the last placed team in world cricket. Everyone knows what happened. 10 months later, Sri Lanka won the world cup, not 10 years later as per his dream. I was in the dressing room during that match with the Sri Lanka team and nobody can imagine how happy and proud the whole team was. And know I will mention a fact which no one who reads this will believe. But it happened. In 1996, the very first tournament after the world cup, found in Singapore with teams from Sri Lanka, Pakistan, Zimbabwe and India. I was at that time the physician and physical trainer of the Pakistan team and when I saw Mr. Punjeeba, I introduced him to our team management as the President of the Sri Lanka Cricket team. Mr Punjeeba, with tears in his eyes said to me, “Dan, when we met yesterday, I forgot to tell you that the day after I left Sri Lanka to come here to Singapore, the board had a meeting and they fired me. Can the reader of this letter how frustrated that president was. He was able to invest in the team, being the president of Coca Cola in Sri Lanka., and he was an excellent organizer. What can a president do better, than in one year, being rated the last in world cricket, to being champions. All what has been said, is not because of disrespect or hate to anybody, but only from love and respect to the current executive board. To the end I would like to mention, one more name which I think did a lot for the players at home and during tournaments. I can easily judge it because I have been present since 1993 permanently all over the world with the Sri Lanka, Pakistan, Israel, and now the Canadian cricket teams. I wish to mention Mr. Mike Henry. He has worked tirelessly for cricket in Canada. There is no one who can be better qualified than Mr. Mike Henry. Here are the facts. He very well informed about international travel, is an internationally recognized umpire and scorer, and I different tours, I have seen him dealing actively with all these matters. Beside that, the players feel very comfortable with him and any worries, they surely will go their Mike. By the way, in each tournament, I know he spends a lot of money for the team, and by that he surely saves a lot of expense for the board. I hope that this letter will be understood in the right sense and it’s not to show the finger at some people but simply to state facts how many of the people of the who are involved in cricket, including myself, see it. Copies to be sent to Chris James (Alberta), Mike Kendal (Ontario), Charles Pais (Quebec), Aizaz Ahmed (Saskatchewan), John Lovelace (Manitoba), Richie Kemraj (New Brunswick), Bhan Deonarine (Nova Scotia), Sarath Chandrasekera (PEI), Vimal Hardat (British Columbia). Cricket Canada president Ben Sennik has broken his silence and spoken about the recent turmoil within the board which has seen the departure of several senior figures. Cricinfo has repeatedly tried to speak to Sennik in recent weeks, without success, but in an interview with the Toronto Sun he brushed off the situation as "unfortunate". In January, chief executive Atul Ahuja was removed and then earlier this month first vice-president Mike Kendall walked out, but not before delivering a stinging broadside at Sennik. Sennik insisted Ahuja's dismissal was "a majority decision of the board" and that he believes for Kendall to complain about that vote in public after the fact wasn't "very ethical." "I know he questioned my leadership," Sennik told the newspaper. "All these things happened after Atul was let go. Mike was on the board for almost 15 months and everything was kosher. His resignation was a surprise. He's [Kendall] a nice gentleman. From Cricket Canada's point of view everything is working like a charm. We don't feel any deficiency." But Sennik made clear that he was unconcerned what anyone thinks of him, and pointed to the turnround in finances as evidence of how well he has done. When he took over in 2003 "we were a bankrupt organisation … we had no audited balance statements. This year our budget has gone to $1 million and the deficit is gone. We are eligible for money from Sport Canada and have big sponsors like Scotia Bank." Sennik finished on a typically bullish note, insisting that Canada would be one of the top four team at the ICC World Cup Qualifiers - "We're going to the World Cup in 2011," he predicted. Critics are less convinced, and there are a number who believe Canada could be pushed to finish in the top six. If they don't then their ODI status will disappear, and that will result in a considerable drop in funding. Canada Cricket Online has received the following press release. We emphasize that the opinions, allegations and accounts of the events contained in this release do not represent the views of this web site and are provided for information purposes. A protest was launched today by Cricket-loving citizens of Canada against the regressive functioning of the Cricket Canada Executive Board. Multiple issues have plagued Cricket in this country, which is the fastest-growing sport in Canada, despite the gross mis-givernance of the Cricket Canada Executive Board, lead by its President Ben Sennik. 1) Abuse of Power: this was on display again today when Chris James, National Selector and President of Alberta Cricket Association walked up to the protestors and threatened them. 2) Theatening of Players: This was done by President Ben Sennik in the presence of the then National Captain, Umar Bhatti, when he threatened then Vice Captain Karun Jethi against taking up a Player Representative positon at the Ontario Cricket Association, as this interefered with his political goals. Karun Jethi has since been dropped from the National Team. Karun is the number 4 ranked Batsman across all ICC Associate Cricket Countries. No response has been received regarding an appeal lodged with Cricket Canada concerning Karun Jethi's non-selection. As a next step, this appeal will be escalated to the Sport Dispute Resolution Centre of Canada (SDRCC). 3) Family-run business in Cricket Canada: Family members and friends of the Executive board members are routinely involved in running of Cricket. As an example, the Technical Analyst Rathan Moorthy is the brother of 2nd Vice President Ravin Moorthy. Multiple player complaints have been received against Rathan by players who knew nothing about Technical analysis 6 months ago is today trying to guide a national team to a World Cup qualifier. 4) Perjury and Misrepresentation: Members of the Executive board have misrepresented facts to players. Karun Jethi and other players were requested to leave their academic and career pursuits to train for the qualifier pending full-time contracts that were to be made available. Now these contracts hold good only till April 2009. This is gross misrepresentation and perjury. 5) Player Abuse and Harrassment: Either being given copies of contracts or receiving montly payments has become a major task. Players and their families are being routinely harrassed in the process of collecting payments or signed contracts from the Cricket Canada board. As a case in point, current national team player Khurram Chohan requested to stay with then Vice Captain Karun Jethi, as Cricket Canada had flown him in from Calgary but had made no provisions for food or shelter. He had no money to stay at hotel and was lodged with Karun Jethi. The list of grievances is long however, the above highlight and give an indication what is happening at the Cricket Canada Executive board. The protest was held today in front of the Hotel where the Cricket Canada Annual General Meeting is being held. No information about this meeting is known to the public and this includes not even a single mention on the Cricket Canada website. So much for a sport that is in receipt of our tax dollars through the federal government. 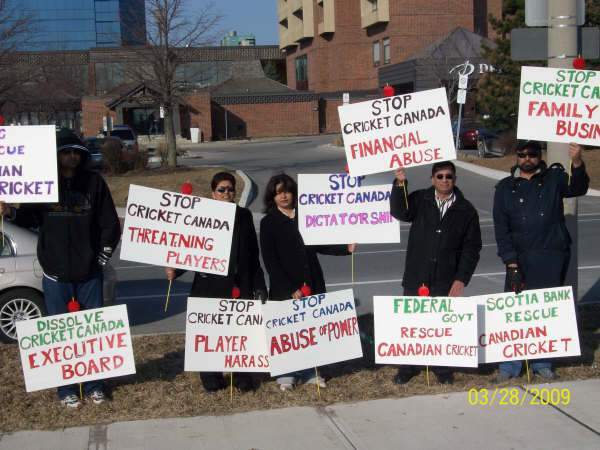 The protest by Cricket loving public which was organised for the first time in Canada was to show solidarity with the players who have been harmed by the autocratic functioning of people who are at the helm of affairs at Cricket Canada. A Canada Cricket Online preview..
Canada undoubtedly will be challenged to meet their goal of qualifying for the world Cup at the ICC World Cup Qualifying Tournament in South Africa. The goal is to finish in the top four, which will book them a spot in the World Cup in Asia. The consolation prize of 5th or 6th- which retains ODI status – is essential at least. How realistic is that top four spot? The format of the tournament is of a round robin in a group of 6 with four teams from each group advancing to the “Super eight” to determine rankings, followed by play-offs to determine final standings. Matches played against other qualifiers in the first round are carried forward into the Super 8. Thus the final play-off round is for pride only- the top four will already have been decided, and matches against other potential qualifiers in the first round are vitally important. There is little doubt that Canada should finish in the top four of their group – their opponents are Oman, Uganda, Scotland, Ireland, and Namibia. Canada should beat Oman who have little experience at this level, and Uganda, who can be dangerous at times. The other teams will be much more challenging. To have a serious chance of qualifying, Canada must beat one of these three, preferably two – advancing in 4th place in the group would make 4th place almost unobtainable. Scotland are a formidable opponent, the defending champions, and have an experienced squad, several with extensive first-class and list A experience. Like Canada, though, the experienced core of the squad is not young. Namibia are currently ranked outside of the top six, but are playing close to home, and have gained considerable experience playing in South African domestic cricket. Canada will play them third, after Oman and Uganda, and this will be a critical match for the Canadians. Ireland, who had an excellent 2007 World Cup, and most of that group of players will be in South Africa. The team has had a successful run since the World Cup, losing only to Scotland amongst the Associates since. They have however not shown good form in warm-up matches prior to the tournament and may struggle. If Canada do qualify- and it is likely that they will do so with 2 or 4 points, then they will needed to do well in the Super 8. Likely opponents there will include Kenya, Netherlands, and two from Bermuda, UAE and Denmark. Kenya are a high quality, experienced side, and Canada will have to perform at their best to beat them. Canada re however well matched with the Netherlands, and on paper at least should be able to handle the other two. Qualifying with two points means that 3 wins in the super eight is essential, and even then may not guarantee a place in the 3rd-4th place match. The Canadian squad seems cohesive and one month’s preparation in Sri Lanka will go a long way to escaping from the confines of Canada’s winter. With only five players in the squad under 30, it’s likely that injury and fatigue will have an effect, and all squad members may have to play a role in the tournament. Captain Bagai is one of the under 30s but he’s played in two World Cups and this is his third qualifying tournament. He’s a fine keeper, and a classy bat who is well suited to play a sheet anchor role. He’ll not be short of advice from former captains Bhatti, Davison, Dhaniram and Billcliff. Cheema and Davison, if they come off, are capable of destroying any attack, although both play a high-risk game. Geoff Barnett, who made a century in warm-up matches, has the chance to show what he is capable of at this level- undoubtedly a top-class player he has all too often failed for Canada. Dhaniram has often made important runs down the order, and Billcliff, Kandappah and Qaiser Ali can provide important support. Jyoti has less experience but also may be needed in the case of a loss of form, or injury. The bowling potentially is strong- Bhatti and Osinde form a strong opening partnership, although Osinde tends to be erratic. Davison and Dhaniram are excellent at curtailing run-scoring in the middle part of the innings, and Rao offers options as a third spinner. There’s little doubt that Chauhan will play a part as fast-medium support, and he’s also capable of contributing useful runs. Greetings regular Hard Yarders.....it feels mighty peculiar to be across the big pond in sunny Johannesburg, sampling the best of South Africa, more especially because i find myself landlocked and a little short of breath. The height above sea level means that my engine is suddenly conscious of the oxygen factor and missing my sea level existence . This country is vast and just buzzing, a veritable cauldron of sport and dreams that makes Sri Lanka ever so special, and actually beyond humble words........with Australia touring and the dramatic IPL series 2 ,due to kick off next month, cricket is certainly flavour of the next few exhausting weeks. Naturally it follows that this is now the sports capital of the world. The facts are hard to ignore and you must forgive me for stepping lightly over reality......yes Joberg,... has one of the highest crime rates in the world, but being here shows the magnificent possibilities that you are confronted with ? THe cosmopolitan nature is tough to ignore and being in Sandton City, colours your judgement to the core, so much so, that the Nelson Mandela Square and its crisp designer layout, trap you instantly. Standing next to the statue of the great man is sadly the closest i will get to seeing this iconic spirit of the modern ecologically challenged, and much troubled universe. A thirty foot Mandela in a Bafaana Bafaana t shirt , promoting South Africa as the host nation for the 2010 FIFA World Cup - is not just imposing, but hammers home what we are desperate for in tropical SRI ? Sport in this country is the lifeline, the bloodline of hope and inspiration that drives the African heart to absolutely incredible heights......black, white, coloured or any other human origin is insignificant ....if you can play and enjoy the challenge ? Lunching in the mall, watching the national cricket team signing posters for elated kids, was plenty to feed on.....kids were lining up for a photo op with their big heroes,... and again my mind wondered why we fail to reward fans in our country....the passion and fervour is universal. The reality will bite only when the tournament proper starts on the 1st of April......the ICC World Cup qualifier to upgrade 4 eager nations to the 2011 super cup and life in the top drawer. There is bound to be a plethora of rich cricket talent, aspiring to breathe the thin air of one day international status, and playing against the biggest and best. Bowling to Dhoni, Yuvrag, Sahin and co, Sangakkara, Mahela, Sanath J, not to forget the Titan Aussies who bat down to 10....is life reinvented. South Africa needs no intro either. I am triple sure, the final 4 to qualify will justify all they get, and drive the ICC ambition to make cricket a global game.....come on down China !!!! Cricket Canada is very much the sign of things to come and i wish them max focus and layers of belief.....to profile up and platform at the top, will require playing above and beyond their normal capabilities. Interestingly, popular thinking is that its down to specifics and character.......success for these lads is on courage, grit, self belief, team spirit and a hunger to prove beyond expectations. If skipper Bagai, Davison, Cheema, Barnett, Sandeep J, fire up the intro overs and put runs on the board, nothing is impossible. Strike bowlers Husky Henry, Umar B, and support from Singh, Katchay gives them plenty of options, but the keys may just lie with their spin triplets......Davison, Dhaniram and the all imposing competent leggie - Balagi !!. Now here is a rare and clever art of leg spin, that may just tear the heart of this associate World Cup, and make Canada a very dangerous contender ? All will be revealed by the super 8 stage and final four on April 19th. Cricket is definitely the business, and with seven full on Supersport tv channels its impossible to miss out. The chance to catch a couple of IPL matches will add to my experience here, and certainly mask my desire to celebrate Africa. Canada played the Netherlands today in their final warm-up match before the World Cup qualifiers. The Dutch have been in excellent form in their warm up matches, and a strong batting performance had the Canadians on the back foot. Netherlands got off to a flying start, reaching 114/1 off 19 overs. Rao proved expensive but steady bowling from Davison and Dhaniram slowed the Dutch charge. Davison's figures were respectable up his final over, when Ten Doeschate hit him for four consecutive sixes. An extraordinary sequence in the 44th and 45th over went 6666.wicket wicket . wicket. Cheema was the somewhat unexpected bowling star, with his medium pace gaining five wickets for 57, dismissing Ten Doeschate for 72 off just 57 balls. The final total was an intimidating 305/8. In reply, the opening pair of Davison and Cheema made, as expected a rapid start with 45 on the board in the 5th over. Cheema (19 off 14 balls with three fours and a six) was caught off Ten Doeschate, but Bagai helped Davison keep up with the run rate. However Bagai (13), Barnett (0) and Davison (48 off 47 balls, seven boundaries) were all out before the total passed 100, and the run rate required began to climb. Canada were 101/ 4 after 20 overs. Jyoti (25) and Dhaniram took the total to 129, but then Jyoti and Kandappah fell to successive deliveries. Balaji Rao made a spritely 28, striking two sixes, but when he skied a catch to mid-wicket, Canada were 189/7 in the 33rd over. Dhaniram, proving once again that he is one of Canada's most reliable players, advanced to his half-century. Qaiser Ali failed and Dhaniram fell soon after with an excellent 69 off 66 balls. It looked all over but Baidwan, clubbed 41 off 27 deliveries and Chauhan kept him company in a last wicket stand of 53. It was too good to last however and Canada were all out for 267 in the 45th over. Warm-ups over, Canada will now focus on Oman, their opponents in their first match of the tournament on April 1st. My time with the Canadians is on the progress curve, and the World Cup qualifier weeks away in April.....the effort is certainly starting to show.....especially for their battery of fast bowlers - Big Husky Henry, using every inch of his looming frame to hit the deck hard. Skipper Umar B, still smarting from the endurance and pool sessions, but generating healthy consistent pace - adds reputation and fiery credibility to the opening attack. With Ketcha - whose fitness and performance level is 25% short of super league, KC a lot more cricket wit with ball in hand and a desire to keep going......and Singh who is able to deliver six different balls - makes the attack fairly hard to ignore. If they keep believing and accepting the yards as investment for their performance......everything is before them, and the World Cup qualifier in South Africa, just another day at the office, or perhaps a few colourful days 9 to 5. Many thanks to Marvan and Pubudu, for a true challenge to pull the Chanshark back into the mainframe, and a fair shot at stamping a few inches of pure SriLankan class, and a sprinkle of island magic, for the Canadians to write home about. The amiable and well travelled manager Mike, plus the Rathan M analysis, makes life a lot simpler at the top and will be vital cogs in coach Pubudu’s wheel of high performance.......good focus to all as they fly off. My instincts have always been my friend and guide, in the middle and under extreme pressure, and I am absolutely energised and exhilarated, that it still has value for the chaps I impose yards on.....it’s come from many years of learning, from winning and losing and from the sheer joy of seeing the hard work kick in.... when you need the extra petrol. Always look beyond the average and never compromise the dream." "Also in Sri Lanka the Canadian National Cricket squad under the guardian eye of former Sri Lanka Test wicket keeper, a most amiable but hard-nut gloveman Pubudu Dassanayake who has conscientiously infused a sense of professionalism into Canadian cricket as they target the big league and a slot in the World Cup. The Associate World Cup in South Africa will give them a real chance of stepping up to full member status and discarding the part time tag once and for all. Currently training in Colombo for 45 days, and contributing vastly to the sports tourist economy and enjoying splendid facilities in the cricket capital of Colombo but most of all and perhaps a truly amazing fact and bonus, they have Marvan Atapattu as their head batting coach. To consider this exposes the glaring idiosyncratic foolishness that ails Sri Lankan cricket where the vast experience of Atapattu, is not able to impart the genius to his own. Analyst, Rathan Moorthy will have tons of material to sift through while seeking to make sense of the strenuous input to enhance the cricket ability of these multi-ethnic Canadians and make Canada a true force in the Associate WC this April and I wish him, his back room staff and the boys in the middle good focus and defined performance all the way through, especially since there's every chance that I might make the trip with a little bit of hand luggage.Interestingly Nottinghamshire also spent a couple of weeks training at the Max Acadamy and soaking in the February sun for their juniors. Baharain and Hong Kong, are regular visitors too, and the business of cricket is still way, under utilised." Geoff Barnett led the way with 107, supported by 77 from captain Bagai, as Canada posted 267/4 against Easterns in a warm-up match. Cheema made 34, Davison just 3. In reply Easterns mustered just 154. Bhatti took 3/29, Osinde 2/35 and Baidwan 2/23 in a good all round bowling performance. Canada meet Netherlands on Saturday prior to their first match of the tournament against Oman. Earlier this month, the South Asian Post reported in a front page story how cricket in Canada faced a major setback with the recent sacking or sudden resignation of three of Cricket Canada’s top-ranking executives, and how those outgoing executives have been critical of the current administration at cricket’s national regulatory body. Today, in an exclusive letter to the South Asian Post, Cricket Canada president Ben Sennick counters charges that controversy within Cricket Canada is undermining the fastest growing sport in the country. Over the past few weeks, there have been a handful of inaccurate reports containing false and misleading statements surrounding some facets of our organization. I must admit that I was quite surprised by the timing of these unfounded allegations as they came during a period where the future of cricket in Canada is extremely bright. The focus of my letter today is not to engage in a war of words over the erroneous statements printed in the March 4th article entitled, "That’s just not cricket". Rather, I’d like to take advantage of this opportunity to clarify these inaccuracies and highlight some of our recent successes. Best-Selling Cricket Book Comes to Canada! Batting on the Bosphorus: A Liquor-Fueled Cricket Tour Through Eastern Europe has just been released in Canada! On the advice of a Montreal psychic, Scotsman Angus Bell sets off in a Skoda to uncover a hidden cricketing world across Eastern Europe. From tournaments on ICE in ESTONIA to university leagues in the CRUMBLING CRIMEA, he finds England's most eccentric game is being played with a passion. But with FINGERLESS 'TAMIL TIGERS' in Prague, mafiosos, and an MI6 SECRET AGENT making the teamsheets, Angus soon discovers a shadowy side of Eastern European cricket. He becomes the first man to hit a ball BETWEEN CONTINENTS, and ends up captain of an international team. Between games, he is pursued by the KGB, becomes embroiled in a DRUG BUST on the MIDNIGHT EXPRESS, and seeks emergency treatment from a ROMANIAN DENTIST. BATTING ON THE BOSPHORUS is a hilarious and unique traveller’s tale, taking the reader 8,000 miles through BALKAN MINEFIELDS, BORDER BRIBES, and Sarajevo GRAVEYARDS at 2 am. It redefines the SPIRIT OF CRICKET, and will make the game’s most sworn enemy a fan. "An IRRESISTIBLE mixture of MADNESS, ADVENTURE, and CRICKET." Joseph O'Neill, author of Netherland. "THERE ARE FEW WILDER RIDES in sport/travel prose than Angus Bell's SUPERB and ORIGINAL book, which brings alive the staid game of cricket and the severity of eastern Europe in equally rich dollops." Available in bookstores across Canada NOW! Grab your copy today! here is a sense that Canada has not yet realised its full potential in the world of international cricket. A huge country with a long and proud cricketing heritage, life in modern-day Canada is as diverse and cosmopolitan as almost anywhere on Earth and certainly cricket has progressed a long way from its colonial beginnings. And that progression looks set to continue. These days, with so many Asian-Canadians and West Indian-Canadians playing the game alongside European-Canadians and even Australasian-Canadians, the players are as likely to be called Bagai or Jyoti as Bilcliff or Davison. And it is that strength in diversity that administrators in Canada are keen to promote and celebrate. As the national team attempts to qualify for its third successive ICC Cricket World Cup, which will take place in the Asian Sub-Continent in 2011, captain Ashish Bagai – a young but experienced wicketkeeper-batsman – is relishing the opportunity of pitting his talents against the best Associate and Affiliate teams in the world at the upcoming ICC Cricket World Cup Qualifier in South Africa. “I can’t wait. This is what we play cricket for – the big occasions – and for Associate teams this is huge,” said 27-year-old Bagai. “A lot of our players are of South Asian descent and some even have relatives over there so to get to play there would be a huge thing for us. Most of us have never played cricket in the sub-continent so we are using that as a motivation tool,” he said. Already a veteran of two ICC Cricket World Cup campaigns, Bagai is about to embark on another and this time he has that all-important experience to go with his well-documented talent, technique and work ethic. From an early age, Bagai caught the attention of national selectors due to the combination of stylish batting and handy glove work. He appeared at two ICC U/19 Cricket World Cups the highlights being an unbeaten 53 against South Africa in 2000, a team that included the likes of Albie Morkel, Johan Botha, Graeme Smith and Jacques Rudolph, and 83 not out in a tied match with Bangladesh in 2002. In the mean time he had staked his claim for a place in the senior side and took part in the ICC Trophy in Toronto in 2001. It was to prove a memorable event for the home team as Canada came third and thus qualified for its first World Cup. Not surprisingly, the 19-year-old Bagai was loving it. “That year there were only three spots in the World Cup up for grabs (compared to four at this year’s ICC Cricket World Cup Qualifier) so it wasn’t easy,” said Bagai. “It was all so new to me that I probably didn’t fully appreciate what an achievement it was to qualify. But going to 2003 World Cup in South Africa was the most exciting time of my life and I enjoyed every minute of it. He missed the ICC Trophy in 2005 but Canada still managed to qualify in his absence and it’s probably fair to say he came of age as a batsman in the build-up to the ICC Cricket World Cup 2007. At the ICC World Cricket League Division 1 tournament in Nairobi a few weeks before the big event he scored 137 not out against Scotland and added a second ton against Ireland four days later. His 345 runs in that tournament at an average of 86.25 won him the player-of-the-tournament award and he was later shortlisted for the inaugural ICC Associate ODI Player of the Year at the ICC Awards in 2007. Just what would he give for a repeat of that form between 1-19 April this year? Canada (squad): Ashish Bagai (captain), Balaji Dorakanti, Eion Katchay, Havir Baidwan, Henry Osinde, Ian Billcliff, John Davison, Khurram Chohan, Umar Bhatti, Arvindan Kandappah, Sandeep Jyoti, Qaiser Ali, Rizwan Cheema, Sunil Dhaniram, Geoff Barnett. he firings, resignations, intrigue, accusations and general pettiness that have dogged Canadian cricket for the past few months must now take a back seat, for the moment of truth is upon us. The World Cup qualifiers begin in South Africa next week and Canada finds itself in the tougher of the two pools. There are 12 teams in this competition that will decide which four International Cricket Council associate countries qualify to play alongside the sport's established teams in the 2011 World Cup. Besides Canada, Pool A has the tournament's two strongest teams – Ireland and Scotland – as well as Namibia, Oman and Uganda. Pool B has Afghanistan, Bermuda, Denmark, the Netherlands, Kenya and U.A.E. The top four teams in each pool will go on to the Super 8 round, where each team will play the four teams from the other pool. The top four teams will then play semifinals and the final. The tournament will be gruelling, with 54 matches crammed into 19 days. However, the schedule is as kind as it can be to Canada, with the first two matches against the pool's weakest teams – Oman on April 1, followed by Uganda the next day. Canada is expected to win these games and not only will they be good practice for the more difficult matches ahead, victory here should also be enough to get Canada into the Super 8 round. Born in Australia, Mel Rilstone emigrated to Canada in 1942 as part of the Commonwealth Air Training Plan and went on to become a pilot. Described as a natural athlete, he played cricket for Canada for a number of years as a top-order batsman and legspinner. His three first-class appearances came against MCC on their tour of Canada in 1951, and then when Canada toured England in 1954. He also held the unenviable record of conceding the most runs off one over in Canada - 34. Dr. Bruce Lang scored 6,6,4,6,6,6 (34 runs) for the Ottawa Valley Cricket Council off his bowling in a match against the Montreal Cricket Association in 1953. Rilstone turned in figures of 5.4/0/81/3. Against the MCC at Lord's in 1954, he dismissed the former England captain Gubby Allen in the first innings, then took the final wicket of the wnd innings ( Bill Voce, another former England test player) as the Canadians won by 13 runs. The Canadian squad is now in South Africa in its final preparations for the World Cup qualifying tournament. They lost Zimbabwe A to in a warm-up match played in Benoni. "The North Americans were using the match as part of their warm-up programme for the International Cricket Council Cricket World Cup qualifier 2009, which is in South Africa from April 1 to 19. Canada won the toss and opted to bat. Pin-point bowling by the Zimbabwe A side had them down by four wickets for just 35 runs in 15 overs, but they made some effort at recovery and built up to 97 for seven in 36 overs, then 136 runs for nine wickets in 42 overs before perishing for 142. In response, Zimbabwe A reached the victory target for the loss of four wickets. Openers Bothwell Chapungu and Eric Chauluka made 16 and 5 respectively and Richmond Mutumbami 24, before the pair of Mbekezeli Mabuza and Mark Vermeulen made an unbeaten stand that took Zimbabwe A home. Mabuza was 61 not out and Vermeulen, the former Zimbabwe international who is making a strong case for a return to the lofty venues in which he used to ply his trade, notched 14 not out." Canada 143 (48.1/50 overs; Sandeep Jyoti 32, Garwe 3/23), Zimbabwe 'A' 145/4 (Mabuza 61*). Zimbabwe 'A' win by 6 wickets. Life hasn't always been easy for the Canadians, on or off the field, since they qualfied for the 2007 World Cup, and with only four slots available this time they will need to up their game if they are to make it through for the third time in succession. But they are hoping that newcomer Rizwan Cheema, who caused a sensation with back-to-back half-centuries against the West Indies last August and then followed it up with another against Sri Lanka in a Twenty20 tournament two months later, will be equally successful against Associates opposition. He is certainly an exciting player, and he will add another dimension to a side which will also have plenty of experience, with the Antipodes-based trio of John Davison, Ian Bilcliff and Geoff Barnett all available alongside other stalwarts like Sunil Dhaniram and Qaiser Ali. Wicketkeeper Ashish Bagai is no mean batsman, and opposing bowlers will remember that he was the player of the tournament when the top six Associates contested Division 1 of the World Cricket League in Nairobi in 2007. So the Canadians will bat deep, and that should make life easier for their attack. Umar Bhatti is a reliable opening bowler, and the squad has been strengthened by the inclusion of ex-Lahore seamer Khurram Chauhan, who provides an alternative to the lively but sometimes wayward Henry Osinde. Other seam options include Harvir Singh Baidwan, at 21 the baby of the side, Eion Katchay and Cheema, while Dhaniram's left-arm spin and Davison's off-breaks will now be complemented by the leg-break/googly bowling of Balaji Rao, a former Indian youth international who took 94 wickets in seven seasons for Tamil Nadu prior to 2001. One question mark against this squad, however, is its age: the average age is 31-plus, and only five out of the fifteen players are under the 30 mark. They may not be the only ones who will find the physical demands of a possible ten games in 19 days tough, but youth is decidedly not on their side. The draw has given them what should be a fairly steady build-up, with games against Oman and Uganda before they encounter the up-and-coming Namibians, Scotland and Ireland. Victory in those first two games would, probably, secure them a place in the Super Eights, but points will be at a premium in the latter stages of the competition, and wins against their main rivals in the group phase would certainly come in handy later. CANADA’S bid to join the elite club of nations that play Test and One-Day International cricket rests on the shoulders on a bunch of Under-17 players currently on a short tour of Trinidad and Tobago. Representing the Ontario Cricket Academy based in Mississauga, the youngsters, apart from Guyana-born wicketkeeper Darren Ramsammy, a Sri Lankan, a Pakistani and an Indian, are all first generation Canadians. And it is the hope of their coaches that within the next few years the cricketers can catapult their country into the international spotlight with performances that can get them into playing the game at the highest level within the next five to ten years. It is a big dream which when realised will be against the odds but one that they believe is attainable assisted in no small part by short competitive tours afforded by organisers in Trinidad and Tobago over the past week. Assistant coach Sunil Khandor said that he was especially pleased that the Ontario Cricket Academy could come to Trinidad and benefit from playing against teams from one of the strongest cricketing nations in the Caribbean. He said his players relish the opportunity to play on turf wickets, an opportunity they do not readily get back home because of the climate and the lack of experienced curators. Khandor said the warm weather also allows his players to get extended spells and build long innings against an opposition that has graduated from strong development programmes. He said the future of the game in Canada is in the hands of the Under-17 players since it is through their individual and collective success that they can attract sponsorship and generate interest for the game in their respective communities in Canada. Khandor pointed to the fact that Canadian cricket gets financial assistance from Scotiabank but admitted that much more funds are needed to provide adequate facilities and incentives to bring the game to a level which can challenge the establish countries. A major step he believes will be a plan to professionalise the game to a certain level in Canada which will ensure the cricketers a livelihood playing the game. But until that happens he expects several players from the Ontario Cricket Academy to land contracts to ply their trade in league and club cricket in England where they can further develop their skill. He said the young players are all looking forward to next year when Canada hosts the Under-19 World Cricket Cup and he expects at least five players from the Ontario Cricket Academy to break into the national team. Khandor said he was grateful for the help provided by Kumar Rampath, a West Indies Cricket Board coaching instructor which has enabled them to lay the groundwork for their ten-day tour of Trinidad. He hopes that a senior Canadian team can visit next year for a longer competitive tour which he said will greatly benefit their effort to make a claim for international recognition. Head coach of the Ontario Cricket Academy is Sri Lankan-born Derek Perera who is assisted by Khandor and Trinidadian Rishi Bal who is originally from Barrackpore in south Trinidad. Bal said that they welcome the opportunity to forge links with clubs and other cricket organisations and interested persons can contact the Ontario Cricket Academy on their website at www.ontariocricket.com. Khandor said that while in Trinidad, his players also had the opportunity to learn a lot about the history and culture of Trinidad and Tobago. “The tour is about their allround development. We want to prepare them for life,” he said. The youngsters participated in the Hindu festival of Phagwa, some for the first time; visited the historic Temple in the Sea at Waterloo; toured the Queen’s Park Oval in Port-of-Spain and conducted a training session there; and saw the world’s tallest Hanauman Statue in Carapichaima. Khandor said the cricketers also spent a memorable time at Barrackpore where they got a glimpse how people lived in rural Trinidad and Tobago. Marlborough's Geoff Barnett is looking to give something back to Canadian cricket when he lines up for the national team at next month's ICC World Cup qualifier in South Africa. The 25-year-old Wairau opening batsman flew out of Blenheim yesterday to join the Canadian team in building up to the tournament that will see the top four sides book a place at the 2011 World Cup. Initially Barnett had considered pulling the pin on his international career after last season but decided, as one of the team's senior players, he owed it at least one more crack. "I hadn't planned on it [playing for Canada this year]," Barnett said. "I've been playing it a bit by ear, but we've got a good team going. Guys like John Davison and Ian Billcliff have put a lot into Canadian cricket. I was lucky enough to go to the last World Cup [in the West Indies in 2007] and got a bit of a free ride to get there. I'd like to help the team qualify for the World Cup in 2011, whether or not I actually end up playing there." The big lefthander said he wasn't sure what his role would be in the Canadian team, but he didn't think he would fill the opener's slot he holds with Wairau and Marlborough. "I picture myself and Ian [Billcliff] more as the guys the rest of the team will try to bat around in the middle order. We've already got a couple of good openers in Davo [John Davison] and Rizwan Cheema." The qualifying tournament features 12 of the world's developing cricket nations, including five that took part in the last World Cup Bermuda, Canada, Ireland, Kenya and the Netherlands. Denmark, Namibia, Oman and United Arab Emirates, Afghanistan and Uganda round out the dozen. Teams are split into two pools of six with the top four from each pool going through to a super eight stage where they will play teams from the other pool. Points gained by sides against other top four teams in their pool will be carried forward to the super eight stage. The top four teams will progress to semifinals and automatically qualify for the next World Cup. Canada have been grouped with Ireland, Scotland, Oman, Namibia and Uganda in a powerful group. Defending champions Scotland and Ireland both have formidable line ups that include English county players, though Barnett said he was picking Namibia as the team to beat. "Namibia will be very good, they've got a lot of South African pros. Arguably we're in the tougher pool, but in some ways that could be a good thing. Even if we qualify fourth it will mean we will have easier games in the second round." While away, Barnett will also have the opportunity to work with former Sri Lankan great Marvan Atapattu, recently appointed as a batting consultant to the Canadian team. Barnett has played 12 one day internationals for Canada scoring 227 runs at an average of 18.91 while in three international Twenty20 matches he averages 32.50. Cricket in Ontario is beginning to come back on track once again as last week witnessed lots of efforts at all levels to strike rapprochements between officials and leagues. The biggest development was Ontario Cricket Association's unconditional status quo invitation to the Toronto District Cricket Association to reapply for membership. "We want them (TDCA) to come back and move the process of cricket in Canada," Mike Kendall, president of Ontario Cricket Association, told SA Focus. "TDCA were our full members and we respect them for being the biggest league in the country," said Kendall. The Toronto League, according to a reliable source, has agreed to rejoin the OCA and is likely to reapply for membership soon. When asked, Mohammad Shaikh, TDCA president, said: "We're considering the offer, but haven't taken any decision yet. "Our board of directors is discussing all the pros and cons, and we want to see the best of cricket in Canada," said Shaikh. Calling it a positive development, Ben Sennik, president of Cricket Canada, said: "It (TDCA) is the oldest and the biggest league in Canada, producing 90 per cent of the cricketers in Canada, and the reality is that we can't ignore them like that." Sennik also clarified: "Two parallel associations at the provincial level (such as the OCA and the newly formed Cricket Council of Ontario) are not possible. There are no two ways about it and we advise everyone to work together for the promotion of cricket." Formed in 1920, TDCA is the largest cricket league in North America, consisting of four divisions and 34 clubs, equalling 65 teams and more than 1,000 registered players. Asked if the same offer was also extended to Etobicoke District Cricket League - which also pulled out of OCA and recently formed its own Cricket Council of Ontario - Kendall said: "No, they are welcome to reapply on their own for an associate membership, but we haven't extended any such offer to EDCL because it wasn't our full member. Last year we gave them the chance to withdraw the resignation and become a full member, but they refuse to do so." According to the OCA president, Toronto District Cricket Association has indicated its willingness to return on par with its earlier status, and OCA is agreeing to give TDCA full member status with the same number of voting powers. "We think keeping them out of OCA will be counter-productive for cricket," said Kendall. This is the second time in less than two months OCA has asked TDCA to rejoin. Stardom, cult status, professional contracts and wealthy careers will all be just a glance away when the national cricketers fly out to South Africa on the morning of March 23 to compete in the 2011 International Cricket Council (ICC) World Cup Qualifier scheduled for April 1-19. True there were some selection inconsistencies like the decision to persevere with the out of sorts Nehal Bibodi and Akbar Baig ahead of enterprising Fred Isabirye and courageous 17-year-old Emmanuel Nakaana but there is no time to whine and sulk about bygones. The return of Nandkishor Patel and recall of Lawrence Ssematimba could prove vital to the team and solve the mid-order (call it muddle-order) batting conundrum. The partisan fans have buried the hatchet with the selectors, saved a fortune to make sure they travel to Mandela’s Rainbow Nation and be first-hand witnesses of Uganda’s enthusiastic cricket team making history. The first hurdle during the January Division III ICC World Cricket League was negotiated with few qualms but the celebrations were muted long time ago because the bitter truth is that nobody will remember the past achievement if the team fails to add on its laurels in South Africa. It will be all about thrilling clashes during the three-week showpiece when the top 12 ICC Associate nations exchange fiery pleasantries. The rewards for the victors are remarkable and Uganda, despite being an underdog, will fancy its chances of spoiling the party for some of the over hyped and complacent favourites. Tickets to the World Cup will be won by the top four sides, the top six-finishers will earn full One Day International (ODI) status until 2013 whereas the top eight, apart from attracting lucrative funding from ICC, will play in the next Intercontinental Cup (4-day games). It is a win-win situation as a top 10 finish will also ensure Uganda stays under the ICC High Performance Programme and continue to get funding worth millions of dollars from the sport’s world governing body. But is the dream possible? “The senior players must come to the party. In Buenos Aires, they failed to come good but hopefully they will come out of their shells. We won’t survive in South Africa if they don’t lead from the front,” national coach Mohammed Ebrahim Barney, never one to mince his words, gives his forthright view on the only way to victory, earlier in the week. Uganda is in Group A with 2005 ICC Trophy finalists Ireland, champions Scotland, Canada, Oman and fellow Africans Namibia. Skipper Junior Kwebiiha and his teammates will play the other teams in the group once with the top four progressing to the Super Eight stage. If Uganda reaches that stage, it will play four Super Eight matches against the sides they did not meet in the group stage and all points attained at the group stage will be carried over to the Super Eight stage apart from those gained against the bottom two from the group. The top two teams will contest the final whereas the third and fourth-placed sides will play-off at Potchefstroom on the final day of action on April 19. But is the mission possible? “We are proven warriors capable of raising our games to fit the occasion. The competition will obviously be stiffer than that we encountered in Argentina but we can spring a surprise,” says 27-year-old all-rounder Kenneth Kamyuka, who finished as the Man of the Series in the January showpiece during which he picked 18 wickets and scored 110 runs. “I believe our group is fair. We have beaten Namibia before, Oman edged us narrowly in our last meeting and I know Canada’s weaknesses because I play with their stars in the same league in Toronto. We have a chance, if we play as a unit,” adds Kamyuka. Is it just mere talk or just proof of the team’s resilience? Whichever way, the champagne on ice. Anything is possible! There is a sense that Canada has not yet realised its full potential in the world of international cricket. A huge country with a long and proud cricketing heritage, life in modern-day Canada is as diverse and cosmopolitan as almost anywhere on Earth and certainly cricket has progressed a long way from its colonial beginnings. Canada and Ireland will meet Zimbabwe A as part of their preparations for the ICC World Cup Qualifiers, but any potential political embarrassment will be diluted as the games will take place in South Africa. Zimbabwe A will play Canada on Tuesday, March 24, and Ireland two days later at the Africa Cricket Association headquarters in Benoni. "We had no hesitation in accepting the invitation [from the ACA]," a Zimbabwe Cricket spokesman told Cricinfo. "Opportunities such as these are definitely what we are looking for to give our next best players the necessary exposure for them to be able to challenge those at the top, thus improving our standard of play." "Ben Sennik has seen his leadership as president of Cricket Canada questioned, he's had his authority challenged, his decisions maligned and watched three members of the board walk out the door in the past year amidst a swirling controversy. "We're going to the World Cup in 2011," he guaranteed, as the national team prepares for the International Cricket Council World Cup qualifiers, now less than a month away: "Four teams will go (to the World Cup from the tournament)," said Sennik, this week. "One of those four will be Canada." Victoria Day weekend in Canada. That is just not cricket! The gentleman's game of cricket would appear to being held hostage in Canada - and the GTA - to the various bodies administering the game. Not that there are so many bodies out there... but those that there seem at present to be working at cross purposes with each other. Just to make matters more interesting, some are also changing their names: the Etobicoke League is in the process of changing its name to Brampton-Etobicoke Cricket League. In all of this, the game of cricket itself, and its players, would appear to be getting short shrift. The immediate and direct fallout is that most players in the GTA, where most of the players are concentrated, will not be eligible to play for Canada. "Yes, that is correct," Ben Sennik, president, Cricket Canada, confirmed to SA Focus. So, as the various organizations seek to work out their differences, the professional careers of deserving players now appear to be at stake. TORONTO - Cricket Canada is pleased to announce today the following training squad that will take part in a 10 day training camp at the Sir Frank Worrell Cricket Centre in Trinidad April 4th to 14th, 2009. The academy visit is preparation for the players ahead of the ICC America?s Women's Championship scheduled for Florida in May 2009. Canada's proposed tour of Zimbabwe, which was part of their preparations for the ICC World Cup Qualifiers, has been scrapped after Cricket Canada backtracked on its request for a series of matches. Zimbabwe Cricket was approached in early February and agreed to host a series of matches in late March to help the Canadians acclimatise. It was intended to play at least four ODIs against a Zimbabwe A side. However, at a board meeting on February 21, Cricket Canada decided to cancel the trip, telling ZC that "there were some concerns about Canada being able to field a competitive side in Zimbabwe as well as taking into account the Canadian government's health advisory for Zimbabwe at this time." "A serious cholera outbreak inside Zimbabwe has resulted in more than 3,000 deaths. But Zimbabwe cricket officials insist touring teams are not at risk of contracting the disease because of better sanitary conditions available to professional athletes and tourists. The series of one-day matches would have been the Canadians' first major overseas tour against a full member country of the ICC." A short clip of the famous match where Ireland dismissed a powerful West Indies side for just 25 has been posted on YouTube. A reminder for all associates that in the right conditions (green wicket, and the opposition partaking too liberally of the hospitality the night before) that anything is possible! Ashish Bagai has accepted the Captaincy and looks forward to lead the finest collection of Canadian cricket talent assembled in some time, as Canada looks to qualify for its third consecutive Cricket World Cup. The core of the team continues to train in Sri Lanka and more squad members will join through the early part of March, based on their employment schedules. The team will move to South Africa in mid March to hold a high performance camp and practice matches ahead of the qualifier start of April 1, 2009. "It's where the first recorded cricket match in Canada was played. Our club is Pirates of the St Lawrence CC, one of the fastest growing cricket clubs in North America, with men and women of 35 nationalities - everything from Austrian to Parsi Zoroastrian. We're going to be hosting Quebec's first ever beach cricket tournament at the end of March." There are no immediate plans to withdraw eight Canadian cricketers training in Sri Lanka, in the wake of a terrorist attack on the Sri Lankan cricket team in Pakistan, Cricket Canada says. The eight Canadians in Colombo are expected to be the core of the national team at a World Cup qualifying event next month in South Africa. "There are concerns, and the concerns are not being overlooked at the moment," Cricket Canada secretary Calvin Clarke said Tuesday in Toronto. "We are certainly keeping on top of the situation, trying to monitor the situation. Our coaches indicated that based on the security that has been provided to us, we should not have any major concerns about the players at the moment because of the location. "But concerns are concerns - and security, you can get assurances but those assurances could go out the window." New Delhi Cricket Canada’s president Banwarilal ‘Ben’ Sennik has appealed to the BCCI to help them to revive the sport in the North American country. Sennik will be meeting BCCI’s chief administrative officer Ratnakar Shetty in Mumbai on Tuesday to try and organise few matches with the Indian team in Canada. Besides Shetty, Ben has sought a meeting with former BCCI chief Sharad Pawar and ICC vice-president in this regard. “I want to sent out a message to India to help us out. A series or few matches against our national team will be a huge boost for our country. And it also makes economic sense,” he said here, close friend and DDCA vice-president Chetan Chauhan by his side. Sennik said the Canadian board had been talking to the BCCI for sometime now, “but talks haven’t moved forward the way we would have like to see,” he added. They were all born outside Canada and learnt their cricket at home. But a rag-tail bunch of immigrants believe lady luck will help their adopted country reach the 2011 World Cup. For a team featuring an accountant, a credit card technician, an IT student, a construction worker, a cricket coach and only one first-class player in batsman Geoff Barnett, cricket remains a part-time job for them. "Like players in other established countries, we are passionate about the game and want to give our best for Canada," said Trevin Bastiampillai, 23, who took a year's sabbatical from his IT studies to pursue the World Cup dream. "Of course we will qualify for the World Cup, I am fairly confident, we can make it," said the Sri Lankan-born Bastiampillai. Sri Lanka is fast becoming a country for overseas teams to come and practice and train during the winter. At the moment the Canadian national team is on a five-week visit preparing themselves for the ICC World Cup Qualifiers in Johannesburg which starts on April 1. Canada's national cricket coach Pubudu Dassanayake has set his sights further ahead than the tournament itself. "We will qualify for the World Cup I am definite," he said. "But we are not just looking to qualify but we want to win. We have the capability of doing it. It's only a matter of putting things together. "If you make it to the final, the ICC has promised us two tours a year against Full Member countries, and if you finish in the first six you keep the ODI status - and ICC funding is also available. The reason why I am planning to win this tournament is if we win we have a good chance of trying to become a Full Member status of the ICC within maybe the next 10 years. Dassanayake, who kept wicket for Sri Lanka in 11 Tests and 16 ODIs, is only contracted with the Canadians until the end of the tournament, but if he steers them to a top-six finish then he had been assured that he will be signed-up until after the 2011 World Cup. His associations with Sri Lanka were not the only reason he opted for the country as Canada's base ahead of the Qualifiers, and he was quick to praise the facilities. "I don't think you can get them anywhere in the world. Financially also it is profitable for us. When you compare the costs in Canada it is relatively cheap to come to Sri Lanka, although we are far away from home." "Sri Lanka doesn't realise the huge potential it has. I took this team to Guyana in November for training and the facilities were terrible. Everything there was expensive. In Sri Lanka the coaching knowledge and the facilities we have are huge." Proof of how much Dassanayake rates the Lankan coaching was established after hired former Sri Lanka captain and opening bat Marvan Atapattu to be the team's short-term batting coach. "He is one of the best batsmen we had from the technical side. At the same time he is also a tough character. I needed his type of approach and his personality in my team. That's why I selected him." Dassanayake stated that batting has been the main weakness in the Canadian team. "If you take the other ICC Associates we have the best bowling side. But batting was always a problem because we were depending too much on a couple of New Zealanders and one Australian. John Davison. who played for us. They are still playing but I want some of the local boys to reach that level to take the team forward." Dassanayake went to Canada in 2001 to play club cricket and moved there a year later with his family. He played for Canada in 2005 and 2006 and after the 2007 World Cup, Cricket Canada offered him the opportunity to become national team coach. H e gladly accepted because it was a role he always wanted to play. His links with Sri Lanka have reaped another benefit, as Sri Lanka's specialist coaches are assisting him in an honorary capacity because of his personal contacts with them. "We have hired only Marvan for batting and Chandrishan Perera to help us on the fitness side. I don't think Cricket Canada would have got this kind of help anywhere in the world," he said. "I am thankful to Cricket Canada for placing a lot of trust in me and allowing me to bring the national team to a country like Sri Lanka without them knowing the potential and facilities that are available here. They took my word and gave me a free hand with the players. The way we have planned out our practices and training is something the Canadian players have never undergone in their careers." The biggest change has been in Dassanayake's insistence that the main players be given full-time contracts, ensuring they are available to practice at all times. And while heat of Sri Lanka caused a few problems for players used to the intense cold of a Canadian winter, they have adjusted well. "The first few days the boys struggled a little to cope up with the heat and humidity so we concentrated the first two weeks on fitness," Dassanayake said. Now they have got used to the conditions." According to Dassanayake cricket in Canada is gaining popularity fast. "It's developing fast because the Asians don't like to play sport like ice hockey or basketball. Now the schools have started to play tournament cricket. Cricket is huge now." I am writing this letter in response to your article/news relating to the resignation of Mr. Mike Kendall, 1st Vice President, Cricket Canada. I have had served on the Board of Governors of the Toronto & District Cricket Association (T&DCA) from January 31, 2008 to March 1, 2009. I was responsible for Constitutional and Legal Affairs of the Association. Mr. Kendall is also the President of the Ontario Cricket Association (OCA) and the Southern Ontario Cricket Association (SOCA). T&DCA had been a vital member of the OCA for many years and had resigned from this body in November of 2008 after failing to achieve critical proportional representation within the structure of the OCA. I have had extensive dealings with Mr. Kendall as the Chair of the Negotiating Committee on behalf of the T&DCA. Under Mr. Kendall’s leadership, OCA and SOCA have not evolved. With T&DCA’s resignation, OCA has limited visibility to be a vibrant Association for the province of Ontario. He is yet to show incandescence in achieving anything for OCA as a leader. SOCA has dwindled to just 7 teams over the years, and he has not demonstrated the necessary leadership to engender growth within that organization as well. So, it is simply appalling that Mr. Kendall is on a media blitz with an accusatorial mode towards other administrators of Cricket in Canada. It is a fusillade and visceral approach, which can be detrimental for the well being of Cricket in Canada. He is also mainly responsible for the ‘impasse’ between OCA and T&DCA. During my negotiations, I had witnessed his high appetite for total disregard for constitutional and procedural protocols. The current situation of the OCA can only be described as incorrigible. Simply put, he has failed to lead. As a member of the playing fraternity here in Canada, I can attest to you that Cricket in Canada has grown by leaps and bounds under the current administration. Credit must go to the leadership for this achievement. If you need any clarifications, please contact me at tsivaraj@sympatico.ca. Mike Kendall lived with what he perceived as inept moves by Cricket Canada's administration. He could put up with "inconsistent" national team player selection. He could accept some disappointment on the scoreboard. But when Cricket Canada recently sent members of the national team into a war zone, he'd had enough. Kendall announced his resignation as first vice-president. "My resignation wasn't about one thing. It is about a lot of things adding up," Kendall said. "Then they sent players to Sri Lanka to train. I opposed that. The security isn't proper. Even the Canadian high commission issued an advisory. The rebel plane that was shot down was only about a kilometre from where the guys are staying. "Last time I talked to them they had to stay in their hotel for two or three days until security improved. Under those conditions how can players practise or concentrate? This is just too much. I figure I'm not able to make any difference anyway (by staying on the board). When it comes to any sensible decision these guys are going to do whatever they want so what the hell am I doing here anyway." Cricket Canada's executive board, under president Ben Sennik, has been buffeted by controversy. Divisions became public when treasurer Bill Siddique resigned. Then, in January, Sennik replaced CEO Atul Ahuja with Ingleton Liburd. "People should be concerned the CEO was fired (allegedly) without being given a reason or even summoned before the board to give his side of the equation," Kendall said. "If you ask (Sennik) he'll say it was a board decision but he pretty well is the board. Everyone else swallows his line and that's the end of it." Telephone inquiries to Cricket Canada for comment by Sennik were not immediately returned. With Kendall's resignation, the board now consists of three people plus Sennik, who Kendall said acts as both president and treasurer. Ingleton and a player representative are non-voting members. "There are problems with administration and I want to bring it into the open. I want sponsors, players, provincial administrators to at least know what was going on and if they want to do something about it, fine," Kendall said. That could happen as soon as Cricket Canada's annual general meeting March 28-29 in Toronto. One of the biggest stakeholders is the International Cricket Council which provides funding -- now more than $800,000 annually. Kendall, who remains as president of the Ontario Cricket Association, wants to get more bang out of that buck. He noted after five years under Sennik's administration the overhaul of an "outdated constitution" still isn't completed. Then there's the national team. "The selection process needs overhaul," Kendall said. "Of the people selecting the team only one has played first-class cricket. I want the selection process handled by people who are capable. We have people like that; people who played Test cricket, who know what is required. They should be at the helm of a selection panel independent of the board. "Influencing the selection is also a problem." In recent months Canada lost all four matches at the Al-Barakah tournament. It lost to the United States in the Americas championship. With World Cup qualifying tournaments approaching this year, "people need to ask some tough questions," Kendall said. Why are there apparently discipline problems on the team? Why are players who don't come to practice still on the team? Why are some of the players who should be there not there? Kendall says Canada has the talent to be better. "Even our national coach has said there is plenty of home grown talent that can compete on the international level, provided they're given proper training, facilities and infrastructure. That isn't happening." Instead, the team has had 32 player changes and five captains in 18 months. "There is no continuity. It's one reason we haven't improved." Since resigning, Kendall says he hasn't heard from Sennik or board members. But he doesn't regret the decision. "If you are vice-president of Cricket Canada you don't just want to give it up. It was not an easy decision (but) I had to do something in the interest of cricket. If I didn't, I'd find it difficult to face the mirror."